Turmal classification (after Burger 1994): Anteturma POLLENITES; Turma MONOPORATES. 1981 Aachenipollis; Pocknall p. 5. 1982 Aachenipollis sp. ; Pocknall p. 284. 1984 Harrisipollenites kapukaensis Pocknall & Mildenhall pp. 46-47, pl. 26, figs 2-5. 1989 Harrisipollenites kapukuensis; Pocknall p. 6. 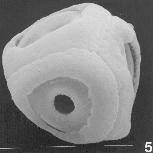 1990 Harrisipollenites kapukaensis; Pocknall p. 150. Natural affinity: Dicotyledonae: Winteraceae (Zygogynum Baill., Exospermum V. Tiegh. and Belliolum V. Tiegh.). NZ age range: Paleogene to Neogene. Cite this publication as: "J.I. Raine, D.C. Mildenhall, E.M. Kennedy (2011). 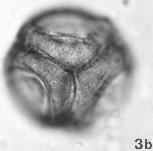 New Zealand fossil spores and pollen: an illustrated catalogue. 4th edition. GNS Science miscellaneous series no. 4. http://data.gns.cri.nz/sporepollen/index.htm". Dallwitz (1980) and Dallwitz, Paine and Zurcher (1993, 1999) should also be cited (see References).